Engineers from Iowa State University have developed a stretchable polymer material that uses tiny embedded rings of liquid metal to reduce the reflection of radar waves. The cloaking device is formed of rows of split ring resonators filled with galinstan, a metal alloy that’s liquid at room temperature but less toxic than mercury. 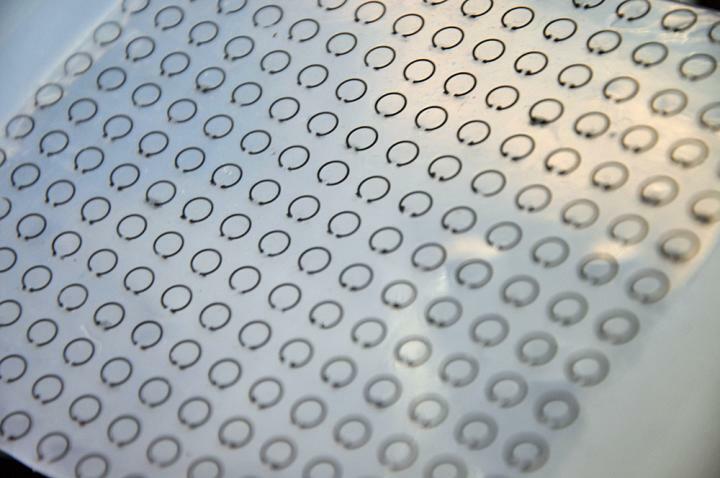 These rings, which have a radius of 2.5mm and a thickness of 0.5mm , are embedded inside layers of silicone sheets. Together they create a resonator that can trap and suppress radar waves at a certain frequency. “It is believed that the present meta-skin technology will find many applications in electromagnetic frequency tuning, shielding and scattering suppression,” lead researchers Liang Dong and Jiming Song from Iowa’s department of electrical and computer engineering note in Scientific Reports. Stretching the meta-skin changes the size of the liquid metal rings, which in turn changes the frequency that the device suppresses. This allows the cloaking device to be “tuned” to a variety of radar frequencies. In testing, radar suppression was about 75 per cent in the range of 8 to 10 gigahertz, with waves suppressed in all incident directions and observation angles. This is different from traditional stealth technologies that often only reduce the backscattering, or the power reflected back to the source of the radar. While the researchers claim the meta-skin could be used on next-generation stealth aircraft, they also say the technology could be a stepping-stone towards more advanced systems, including invisibility cloaking. We badly need this to combat the Mega-Stoopid city major here in Mexico City, and his million Radar Photo Ticket cameras business! I must say “Bravo” to this endeavor. Apparently, in the future, Klingon technology will have nothing on us, literally. Jim Kirk will only have Spock sweep the radar frequencies up and down the spectrum on the long range sensor array. Maybe the Klingons will make a ballon of the material that they can expand and contract to avoid detection? Live long and get rich quick.